Sarcophagus of Pharaoh Seti (Sety) I of XIXth dynasty. SM M470. ©Sir John Soane's Museum, London. Photo: AC Cooper. 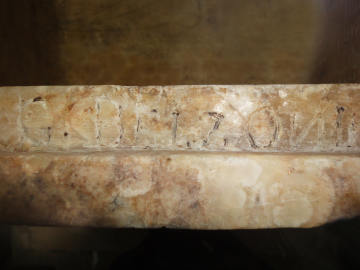 Inscription note: Hand carved into the rim of the sarcophagus at the west end by Giovanni Battista Belzoni, presumably before it was removed from the tomb in 1825. The capital N is carved in reverse; there is no known reason for this. The alabaster sarcophagus of Seti I was discovered in the tomb of that Pharaoh by Giovanni Battista Belzoni in October 1817. The tomb itself is the most magnificent of that splendid series of rock-cut tombs in which the Pharaohs were buried during the 16th, 15th, 14th, 13th, 12th and 11th centuries before Christ. The walls and most of the roofs of Seti's tomb are painted or sculptured with various religious texts and emblems, the chief of which illustrates the journey of the sun through the world of Night and thick Darkness. The sarcophagus stood in the largest hall, almost at the end of the tomb, which runs horizontally about 350 feet into the cliff. The hall was hewn out of the solid rock, and six pillars of the rock were left standing to support the super-incumbent weight. The walls and roof of the hall were elaborately decorated. The sarcophagus consists of two monolithic blocks of alabaster, and is inscribed over the whole surface with religious scenes and figures incised and then filled in with a substance called 'Egyptian blue'. Though most of the blue filling has disappeared, it can be seen here and there. The effect when it was complete must have been extremely beautiful. It is mummiform in shape. The cover, which was sculptured as a portrait of the dead King, was smashed in ancient times by tomb-robbers in their efforts to reach the jewels buried with the mummy, but enough remains to show that its height was 1ft. 3 inches. Smashing was necessitated by the method of securing the cover to the lower part, a method commonly used in royal burials, but which however seems to have been ineffectual against determined robbers. It was as good a method as any other for it ensured that the only way to open the sarcophagus was by breaking the cover to pieces. 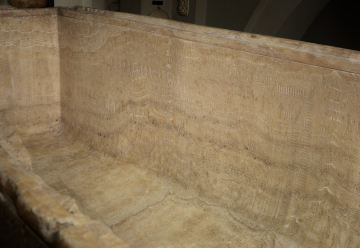 The method was this: grooves were cut in the thickness of the walls of the lower part of the sarcophagus and similar grooves at the same distance apart were cut in the thickness of the sides of the cover. Slips of copper were slung up over the lower part and gently lowered till the two sets of grooves coincided; it was then let down, and the slips of copper were then so far embedded in the stone as to be unreachable by any tool, and there was no possibility of levering the cover off the lower part. There are two versions of the Sun's journey through the Under World. 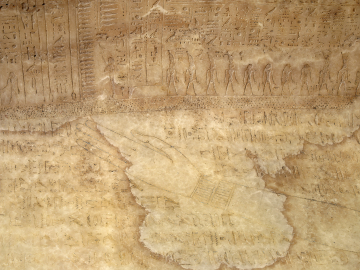 The longest, and perhaps the most detailed, is found on the walls of the royal tombs; this version is known as Ymi Duat The Book of Him who is in the Under World. The shorter version has been given the modern name of The Book of Gates. This version is almost invariably the one used for the decoration of royal sarcophagi. In the Book of Gates the Under World is divided into twelve portions, which were equated with twelve hours of the night. Each hour was divided from the next by a gate, guarded by snakes and a warder; no one could pass through any of the gates without giving the password. Ra, the Sun-god, was believed to die every night and his dead body was carried through the Under World in a boat; for, as the highway on earth was the Nile, there was also a Nile in the Under World and another in the sky, so that the Sun was supposed to travel always by water. In the Underworld the Boat was towed by various gods and goddesses who protected the Sun from the many dangers of that dark and dismal country. In the representation of the night journey of the Sun, the Underworld appears divided into three horizontal registers. The central register is the river on which the Boat floats; the upper register is the farther bank of the river, the lowest register is the near bank. Both banks are filled with the denizens of the land; special attention being given to the punishment of the wicked, i.e. those persons who in life had not worshipped Ra. These blasphemers were thrown into the Flaming Lake or drowned in boiling pools. 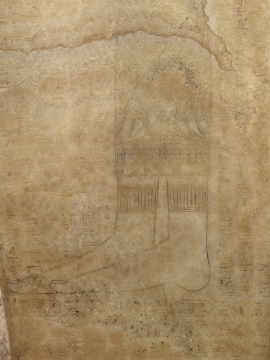 Fifth hour (outside, left, near feet): Osiris as Judge of the Dead. He sits enthroned on a dais raised up on nine steps. In front of him is the balance in which the hearts of the dead are weighed against the ostrich feather, the emblem of the goddess of righteousness. Ninth hour (outside, right, near feet): This section is remarkable for the number of strange figures of snakes. Of these there is at present no satisfactory explanation. Tenth hour (inside, left, near feet): Here the monstrous snake, Apophis lies in wait to destroy the Sun, but is foiled by the deities and worshippers who surround Ra. They bind Apophis with cords and chains, but though they are called the 'Strong-armed'; their strength is insufficient to hold him securely. A giant hand rises out of the ground and grips the chain firmly so that the monster cannot escape. The struggle lasts into the Eleventh hour (inside, left, near head) when Apophis is finally overcome and Ra is saved. Twelfth hour (inside, at the head): The Sun-boat emerges triumphantly. The curious circular figure is 'Osiris encircling the Underworld'; on his head stands the sky goddess, Nut, she 'receives Ra' as he comes forth to the day. The main portion of the picture is the great figure of the good Nun rising out of the primeval waters, and supporting the Boat on his up-raised arms. His name is above his head, and the inscription says: 'These arms come out of the waters, they raise this god'. In the centre of the Boat stand the two goddesses Isis and Nephthys, holding up the scarab, the emblem of the resurrection and new life; and the scarab in its turn supports the newly risen, newly born sun. The rest of the Boat is crowded with various deities. The bottom of the sarcophagus is sculptured with the figure of the sky-goddess Nut, and the inside of the cover is also covered with figures of deities who were supposed to receive the King when he died. According to early records, the sarcophagus was acquired with 18 pieces of the lid (see X59 and X73; one of the pieces is in fact part of a canopic jar and is now catalogued as Museum number X74). The Museum also owns a cast of another piece of the lid presented in 1961 (X164). 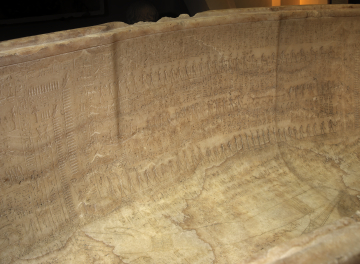 The sarcophagus has been displayed in a glass case since 1866. The sarcophagus is regarded as one of the most important objects ever found in Egypt. It is continually mentioned in all studies of the XIXth dynasty and of the religious texts of that period. 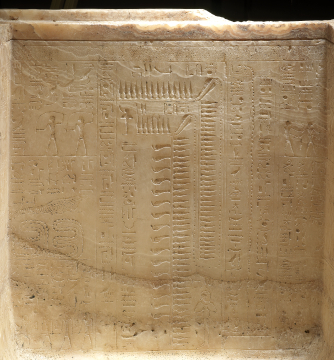 The most complete account of it, with translations of the inscriptions, is by Sir Ernest Wallis Budge, (An Account of the Sarcophagus of Seti I, King of Egypt, B.C. 1370, Soane Museum Publication no.2, 1908). The history of Soane's acquisition and installation of the Sarcophagus is contained in Description 1930, p.63ff., figs.34, 36, together with further notes by Sir E.A. Wallis Budge and in Helen Dorey, 'Sir John Soane's Acquisition of the Sarcophagus of Seti I', The Georgian Group Journal, 1991. NOTE: Cornelius Vermeule, when he compiled his Catalogue of Soane's antiquities in the 1950s noted that 'Mrs. Perry T. Rathbone of Coolidge Hill, Cambridge, Massachusetts, a descendent of Joseph Bonomi, possesses a portrait of the second Curator (by Charles Martin, son of John) studying the inscriptions on the sarcophagus, in the Museum. The painting is signed and dated 1867. Mrs Rathbone's grandmother, Joseph Bonomi's daughter, remembered having played around the sarcophagus as a child'. This portrait is now on long-term loan to the Soane. 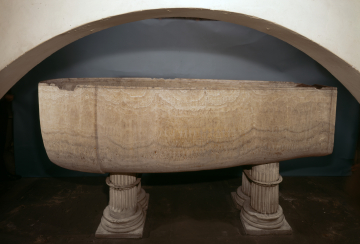 The history of Soane's acquisition and installation of the Sarcophagus is contained in Description 1930, p.63ff., figs.34, 36, together with further notes by Sir E. A. Wallis Budge. Sir E. A. Wallis Budge, An Account of the Sarcophagus of Seti I, King of Egypt, B.C. 1370, Soane Museum Publication no. 2, 1908. Description of Sir John Soane's Museum, 1930, p. 63, figs 34, 36. Helen Dorey, 'Sir John Soane's Acquisition of the Sarcophagus of Seti I', Georgian Group Journal, 1991, pp. 26-35. John H. Taylor and Helen Dorey, Sir John Soane's Greatest Treasure: The Sarcophagus of Seti I, London, 2017.